Before I get started on the review, a bit of background to this project, if you’ll indulge me. My sister was invited to a Nigerian first birthday party, for which the parents had selected this particular African wax print fabric as the one they would get for their nearest and dearest, to make something to wear to the party. This is customary for big celebrations like weddings, birthdays etc, so all the friends and family are wearing outfits from the celebration cloth. My sister’s boyfriend is Nigerian so over the last few years she has been to quite a few of these events where she’s had to make something up to wear. In my newfound enthusiasm for sewing, I said a couple of months ago that I’d make her next one.. which turned out to be this one! We started off looking at some of my patterns, which are mostly fairly simple patterns from independent pattern companies, with not too many pattern pieces and lovely detailed instructions. She umm’d and ah’d a bit and we were thinking about a couple of options, but three weeks before the party we still hadn’t decided on one. My mum told me the other day that I’d inspired her to dust off her sewing machine and start sewing again, which I took as a huge compliment! She ordered a whole bunch of patterns, one of which was this relatively new one from Vogue – V8997. In no time at all she had whipped up a gorgeous version of view B in a lovely red African wax print, and once my sister saw it, she decided that that was the pattern she wanted to use! Now, I hadn’t seen how it was put together, but it looked lovely on my mum, so I was excited to get going! Style: A fitted, princess seamed, bodice going into a panelled full skirt that has the effect of a circle-type skirt but was suitable for a directional fabric because of the way it’s made up of panels. Sizing: My sister fell between a pattern size 14 and 16 based on her measurements, so, being nervous about cutting into that fabric and ending up with something too small, I cut a 16. This ended up being a huge mistake (see alterations). Mum says I should have just gone with her dress size as Vogue/’proper’ patterns always come up huge if you go with the pattern size instead. Now I know! Instructions: The instructions and pattern pieces were clear and easy to follow. Vogue have rated this an ‘easy’ pattern and I have to agree. It was my first time sewing princess seams, but I basically treated them much like sleeves in terms of how I approached easing them together, and they turned out alright first time! Despite the fact that there were 28(!!!!) pieces of fabric/lining/interfacing, this was actually not bad to sew. I did struggle with the way they advised you to stitch up the shoulder seams, and ended up unpicking that section and using the technique I’d used for my Sew Over It Silk Cami (and this helpful video tutorial on Sew Over It’s YouTube channel) instead. I find that technique much easier. Going way up on the sizing. I should have stuck with the smaller size, knowing she wanted it to look quite fitted on top, and gone into the seam allowance if necessary – after all, there are four seams on the bodice and about a hundred eight on the skirt. Not fitting the skirt and bodice before putting it all together. I did get my sister to try it on while they were separate pieces, and they did look big, but I thought that somehow by the time I’d attached the skirt, some of that ease would come out and the rest could be taken out of the back seam at the zip. Fail. Not getting the back neckline curve right before attaching the skirt to the bodice. My sister specified that she wanted a deep back neckline, and I could see at the first fitting that it wasn’t *that* deep, but again, for some reason wanted to see what it was like when the whole thing was put together. What followed was several hours of tweaking the numerous seams to pull it in evenly, and a bit of hand drafting of the deeper back neckline, in chalk, on the bodice itself. If anyone looks closely they’ll see that the back neckline is not symmetric and it probably could have used a hook and eye above the zipper. Time taken: Hard to say, it wouldn’t be fair to guess since I’ve worked on this in bits and pieces over the course of almost two weeks. The initial sewing up didn’t take that long, despite the number of pieces, but all the fit corrections I needed at least doubled the time it took. Would I recommend it? : Yes. I intend to order the pattern for my size at some point when I’m allowed to pattern shop again. It has straight skirt options, and some sleeved/contrast options too. It’s nice that as a relative newbie, I was able to make such a nice style of dress and it’s really flattering in person on both my mum and my sister, who have different body silhouettes. On the whole, I’m really happy with how it turned out, and my sister says she is too. I’ll add some pictures of her at her event as soon as I get them. Gorgeous dress! That fabric is lovely! Your sister looks beautiful in it! Thanks Emily, she tends to look gorgeous in everything but I must admit I’m proud of the dress! And yeah, the fabric is lots of fun lol. I love the fabric. The colours are so vibrant! And the dress looks beautiful on your sister. Nice job! Gorgeous dress, absolutely fabulous fabric, beautiful sister – and what an amazing tradition! What a brilliant thing to do (for families that know how to sew, at least). Thank you so much, and on behalf of my sister too lol! Yes it is a lovely tradition and I love how those of us born and bred elsewhere are keeping it up but combining cultural heritage with the contemporary styles we wear the rest of the time too, in a nod to being both British and, in our case, Ghanaian. 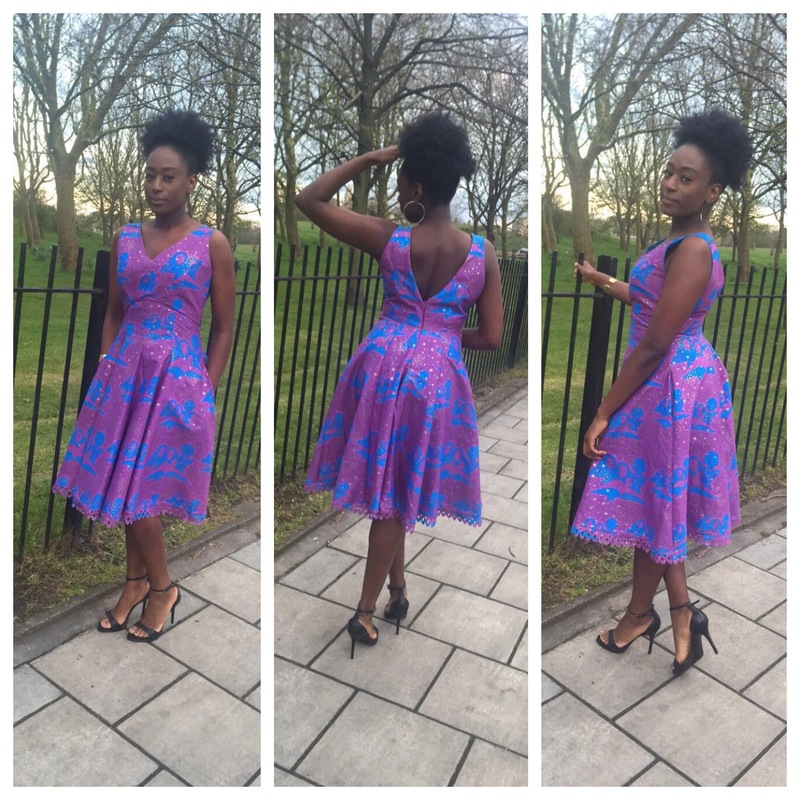 I love the traditional Ghanaian full length mermaid-skirt styles too which are so flattering! Thanks for doing an amazing job!! It was very flattering and I absolutely loved it! And thank you to your readers for the lovely comments!! Hi congratulations to you and your sister for a very gorgeous dress. My heart skipped a bit when I saw your fabric. The print is very significant to me and many other women because it features the logo of the Women’s Ministries in our church. Would you be able to tell me where/how to get the fabric? Your help will be much appreciated. Hi Girlie Mae, thank you and wow, I can see I’ll have to rename my blog post 😊 .. I’m told the fabric was bought from the Liverpool Street area in London, there is a road there with lots of fabric stores/stalls and it came from one of them. Sorry it’s not more specific but I hope that helps, if you’re in the London area! It represents women with a book. It may be a Bible, representing spiritual growth. The women may be learning for themselves or teaching others. It may be a literacy book. It may be that the women are studying leadership or mentoring other woman. Or it may be a book on any of the other areas of interest to women, but women are growing and sharing. It represents women supporting and caring for each other; together they represent an important part of the church, and together they can make a difference. Have a nice day! Looking forward to seeing more of your gorgeous makes!